Pneumomediastinum (from Greek pneuma – "air", also known as mediastinal emphysema) is pneumatosis (abnormal presence of air or other gas) in the mediastinum. First described in 1819 by René Laennec, the condition can result from physical trauma or other situations that lead to air escaping from the lungs, airways, or bowel into the chest cavity. Pneumomediastinum and right sided pneumothorax post first rib fracture in a mountain biking accident. Pneumomediastinum is uncommon and occurs when air leaks into the mediastinum. 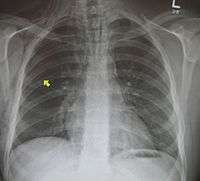 The diagnosis can be confirmed via chest X-ray showing a radiolucent outline around the heart and mediastinum or via CT scanning of the thorax. Bowel rupture, where air in the abdominal cavity tracts up into the chest. It can be induced to assist thoracoscopic surgery. It can be caused by a pulmonary barotrauma resulting when a person moves to or from a higher pressure environment, such as when a SCUBA diver, a free-diver or an airplane passenger ascends or descends. In rare cases, pneumomediastinum may also arise as a result of blunt chest trauma (e.g. car accidents, fights, over pressure of breathing apparatus), while still evolving in the same fashion as the spontaneous form. Pneumomediastinum is most commonly seen in otherwise healthy young male patients and may not be prefaced by a relevant medical history of similar ailments. The main symptom is usually severe central chest pain. Other symptoms include laboured breathing, voice distortion (as with helium) and subcutaneous emphysema, specifically affecting the face, neck, and chest. Pneumomediastinum can also be characterized by the shortness of breath that is typical of a respiratory system problem. It is often recognized on auscultation by a "crunching" sound timed with the cardiac cycle (Hamman's crunch). Pnemomediastinum may also present with symptoms mimicking cardiac tamponade as a result of the increased intrapulmonary pressure on venous flow to the heart. The tissues in the mediastinum will slowly resorb the air in the cavity so most pneumomediastinums are treated conservatively. Breathing high flow oxygen will increase the absorption of the air. If the air is under pressure and compressing the heart, a needle may be inserted into the cavity, releasing the air. Surgery may be needed to repair the hole in the trachea, esophagus or bowel. If there is lung collapse, it is imperative the affected individual lies on the side of the collapse, although painful, this allows full inflation of the unaffected lung. ↑ Laënnec RTH. De l’auscultation médiate ou Traité du Diagnostic des Maladies des Poumon et du Coeur. 1st ed. Paris: Brosson & Chaudé; 1819. ↑ Roguin A (2006). "Rene Theophile Hyacinthe Laënnec (1781-1826): the man behind the stethoscope". Clinical medicine & research. 4 (3): 230–5. doi:10.3121/cmr.4.3.230. PMC 1570491 . PMID 17048358. ↑ Vázquez JL, Vázquez I, González ML, García-Tejedor JL, Repáraz A (2007). "Pneumomediastinum and pneumothorax as presenting signs in severe Mycoplasma pneumoniae pneumonia". Pediatric Radiology. 37 (12): 1286–8. doi:10.1007/s00247-007-0611-1. PMID 17899058. ↑ Hatzitolios A, Ntaios G (2007). "Spontaneous Pneumomediastinum May Be Associated with Both Anorexia Nervosa and Obesity". Lung. 185 (6): 373. doi:10.1007/s00408-007-9037-7. PMID 17909893. ↑ Utsumi T, Shiono H, Fukai I, Akashi A (2007). "Artificial pneumomediastinum facilitates thoracoscopic surgery in anterior mediastinum". Interactive cardiovascular and thoracic surgery. 6 (3): 411–2. doi:10.1510/icvts.2006.147355. PMID 17669882. ↑ Tetzlaff K, Reuter M (1998). 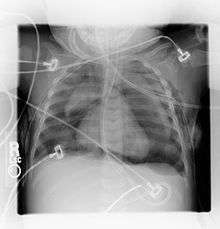 "Recurrent pulmonary barotrauma (PBT) in a previously healthy male scuba diver who suffered from repeated pneumomediastinum after shallow-water scuba dives". Undersea Hyperb Med. 25 (2): 127–8. PMID 9670439. Retrieved 2008-06-05. ↑ Jacobson FL, Loring SH, Ferrigno M (2006). "Pneumomediastinum after lung packing". Undersea Hyperb Med. 33 (5): 313–6. PMID 17091828. Retrieved 2008-06-05. ↑ Nicol E, Davies G, Jayakumar P, Green ND (April 2007). "Pneumopericardium and pneumomediastinum in a passenger on a commercial flight". Aviat Space Environ Med. 78 (4): 435–9. PMID 17484349. Retrieved 2008-06-05. ↑ Yellin A, Gapany-Gapanavicius M, Lieberman Y (1983). "Spontaneous Pneumomedistinum: Is It a Rare Cause of Chest Pain?". Thorax 38:383-385. ↑ Cicak B, Verona E, Mihatov-Stefanovic I, Vrsalovic R (2009). 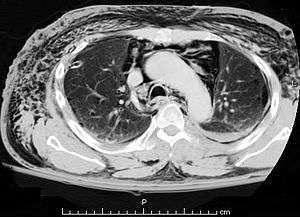 "Spontaneous Pneumomediastinum in a Healthy Adolescent". Acta Clinica Croatica 48(4):461-7. ↑ Quresi SA, Tilyard A (2008). "Unusual Presentation of Spontaneous Mediastinum: A Case Report". Cases Journal 1:349. doi:10.1186/1757-1626-1-349. Look up pneumomediastinum in Wiktionary, the free dictionary.